Enter your dates to pick from 79 hotels and other places to stay! Conveniently located in Apia, the stylish Amanaki Hotel offers spacious rooms with ocean views, plus an outdoor swimming pool and an à la carte restaurant. Tropical breakfast is included each morning.... The staff are delightful, they felt like family. The restaurant served delicious food at very reasonable prices. Everyone eats there! The view from the restaurant is stunning. The pool was gorgeous. The room is spacious, the bed is comfortable and the shower was perfect. Also, the location made it very easy to walk to the center of town and it was always easy to grab a taxi. 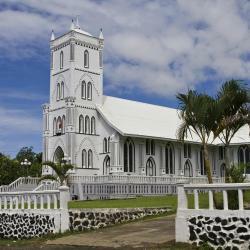 Apia Central Hotel Samoa offers accommodations in Apia, just an 8-minute walk to Apia Bay. I really like it,do clean and neat..I love it..
Just 5 minutes' drive from Apia's town center, Su Accommodations Apia offers private rooms with a desk and flat-screen TV. Free onsite parking is provided. Everything was perfect. Location, cleanliness, room service, customer service was excellent. Overlooking beautiful Asau Bay, Vaimoana Seaside Lodge features traditional Samoan accommodations with a private balcony and ocean views. Everything was in great standard . The Samoan Outrigger Hotel offers a pool, Wi-Fi access and accommodations with air conditioning or mosquito netting just 15 minutes’ walk from downtown Apia. It was a very good place to stay. You can take a bus just outside if you want to go to the city centre. The pool and the staff was amazing. Located on Apia Harbor, Aggie Gray's Hotel & Bungalows is a waterfront hotel housed in a colonial property built in 1930. People are very friendly and polite. Free buffet breakfast is included at this hotel, which offers spacious air-conditioned rooms with private balcony and private bathroom. Concerned about my safety because it was my first time in Samoa and I'd heard many things said about Apia. Tricia T. (Manager) went above & beyond to provide me with the peace I needed to enjoy my vacation! GOD bless you all. Set on 15 acres of tropical gardens, Tanoa Tusitala Hotel offers air-conditioned rooms just 1312 feet from Apia’s waterfront. Each room includes a spacious bathroom, cable TV and a patio or balcony. Overall I loved the environment with the friendly service especially our booking reservation representative Helen. From talking to her via phone prior to our arrival the hospitality was GREAT:) We will definitely visit again along with our grandchildren who LOVED it. Featuring an outdoor swimming pool, Samoana Boutique Hotel is set in Apia and also provides barbecue facilities and a shared lounge. The restaurant onsite, cleanliness of the rooms and facility, all kitchen wear needed for cooking and loved the shower. It was huge! Hotel Elisa offers accommodations in Apia directly opposite Sogi Recreational Area and Apia Bay. There is an on-site bar and restaurant and an outdoor swimming pool. Food. It was awesome for us who live overseas all year round to have our typical Samoan food for continental breakfast. I love the vaisalo , supo esi and the wheat toast. I forgot to ask if there’s any egg or some kind of food with protein for diabetic patients so I can Buy for my hub who has diabetes. Located at the base of its namesake Mount Vaea, this family-run hotel is 3117 feet from Apia's town center. Lupe was amazing! She is amazing and goes above & beyond to make us feel as welcome & comfortable as possible. She is a gem! Set on a beautiful waterfront lagoon, Savaiian Hotel features an on-site restaurant and bar with free breakfast. There is a seaside swimming pool offering views over the lagoon and neighboring... Welcoming staff and great location. Extremely accommodating when we had some schedule changes due to weather. We stayed in a few different rooms and all were comfortable, clean, and good value. Highly recommended. Apia Inn is offering accommodations in Apia. Among the various facilities are barbecue facilities, a garden, as well as a shared lounge. Staff on site can arrange airport transportation. 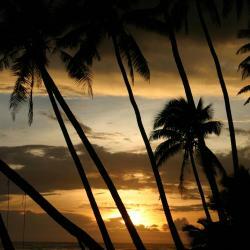 Travelers Point Hotel offers accommodations in Apia, within 5 minutes' walk of local restaurants. The hotel features an outdoor swimming pool and barbecue facilities. First off all the staff and their service are on point!! Loved staying at travellers point. Beds are comfy, very clean & food was delicious!! Just 10 minutes’ walk from Apia Harbor, Talofa Inn features BBQ facilities, a communal kitchen and a guest lounge with a TV and a DVD player. Impeccably clean and excellent customer service. Center of town and a great location. 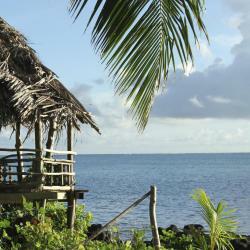 Featuring air-conditioned accommodations with a terrace, Samoana Cottage is located in Apia. Guests staying at this bed and breakfast can use the fully equipped kitchen. A beautiful private BnB cottage in Siusega owned by a lovely couple. Wonderful home for a family. Aircon in two rooms. Washing machine, clean bathroom, Big fridge, outdoor veranda, very comfy beds. Everything you need is available, Lots of storage. Me and my sister Luisa stayed here for 6 nights with our girls. Absolutely love it and will definitely stay here again. Only a 3min walk up to Farmer Joes supermarket. Easy to catch bus, quite and beautiful. Will recommend this lovely home to anyone. Jason was always lovely and easy to deal with. Thank you Jason and Mareva. Uili's Farm House is located in Apia. Guests staying at this apartment can use a fully equipped kitchen. The apartment also has a bathroom. Guests can relax in the garden at the property. The host welcomed and treated us with respect during our stay. The facilities are fully furnished, clean and in excellent condition. Very close to town with a beautiful garden and private space. 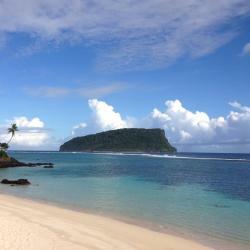 Offering a garden, Samoan Highland Hideaway is set in Apia. The accommodations comes with a seating area. Some units feature a balcony and/or patio. There was nothing to dislike. The Hosts attention to detail, the beautiful gardens, the peace and quiet.